That is a massive 30% discount for international customers who already have the 10% sales tax automatically deducted when they enter a non-Australian delivery address. As always any questions, queries, feedback, requests feel free to drop us an e-mail at info@spiritgallery.com.au or call us on 61 (2) 92475961 and we will do our best to help you. After a long wait we are pleased to announce the arrival of some new Earl Clements didgeridoos. Beautifully painted in the classic Western Arnhem Land style these didgeridoos will make a perfect addition to any collection. In the coming weeks we will also be receiving some new artworks on canvas from Earl. A gorgeous bunch of new Arnhem Land Yidaki have also arrived including two special ceremonial large Djalu Gurruwiwi Yidaki. This is the finest group of Yidaki we have received in terms of playability and artwork. Check out our new Yidaki online. In the coming weeks we will also be receiving new didgeridoos from Heartland Didgeridoos, CrookedStixz, Tristan Omeara, Trevor and Olivia Peckham and some Wix Stix Didgeridoos. 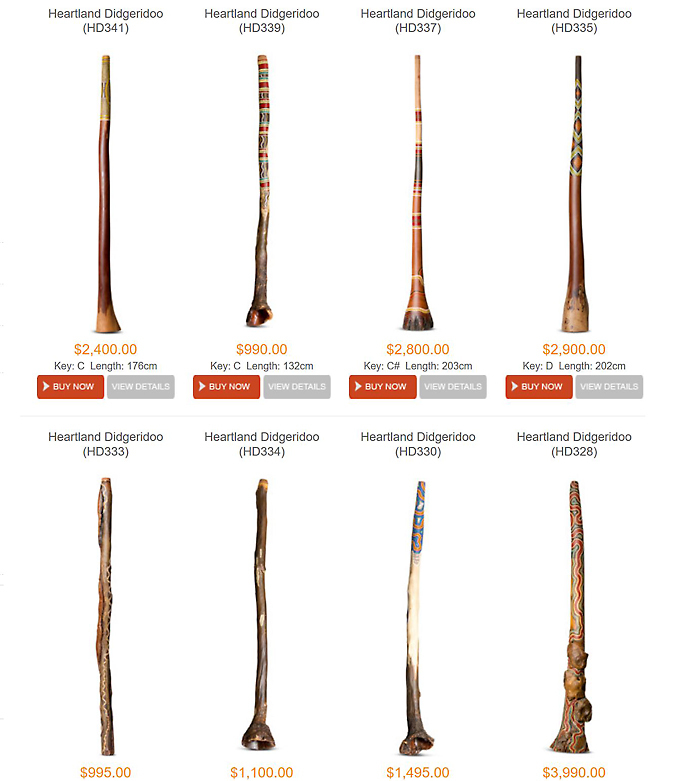 Over 200 didgeridoos online from Australia’s premier didgeridoo collection. The Spirit Gallery Didgeridoo Starter Pack has now been launched! Are you looking for a quality hand picked music quality authentic termite hollowed eucalyptus didgeridoo with all the accessories in the one value pack. Spirit Gallery’s one and only sale of the year has now arrived!! For the whole month of September, we will be offering 15% off the price of our entire range of didgeridoos and artworks purchased online. That is a massive 25% discount for international customers who already have the 10% sales tax automatically deducted when they enter a non-Australian delivery address. The wait is over! Introducing our newest didgeridoo range – Jesse Lethbridge Didgeridoos. 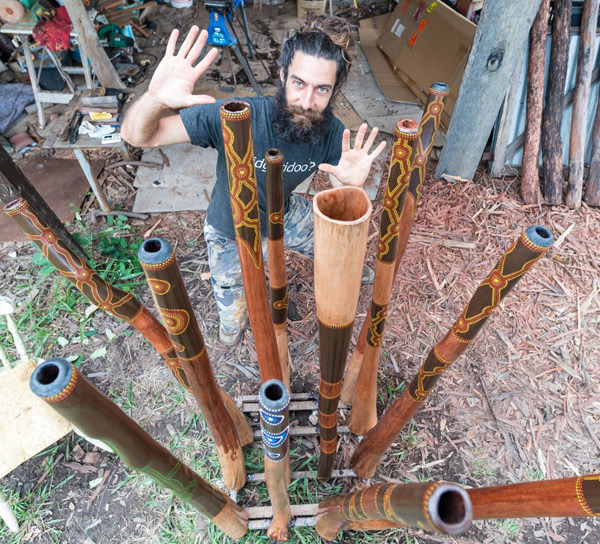 Most didgeridoo enthusiasts would already know Jesse for the high quality perfectly crafted instruments he has been producing for almost 15 years. Jesse has also produced several albums, both didgeridoo and multi-instrumental, and often tours around Australia. Jesse started playing didgeridoo in 1998. In 2000 he traveled throughout Australia to deepen his connection with the didgeridoo, culminating in a visit to Arnhem Land where he spent time with internationally renowned didgeridoo maker, player and spiritual custodian of the didgeridoo, Djalu Gurruwiwi. My workshop is in the pristine Bellingen shire in New South Wales, Australia. where its mostly balmy enough to work outside. I live and work on an acreage with my beautiful partner and two children. I am following my bliss; playing music, making instruments, singing, exploring the world, basking in nature and family life. Alongside my love to play the didgeridoo, I play 6 and 12 string guitar, mandolin, percussion, native American flute, first generation hang and recently began journeying with the gubal. Enjoy checking out my creations! We are delighted to be able to showcase these wonderfully crafted instruments to the world. Buy your Jesse Lethbridge Didgeridoo Today! Its been a busy last couple of months at Spirit Gallery as we set yet another new “didgeridoo upload” record, having added over 110 didgeridoos in the last 6 weeks. We now have over 200 didgeridoos online. 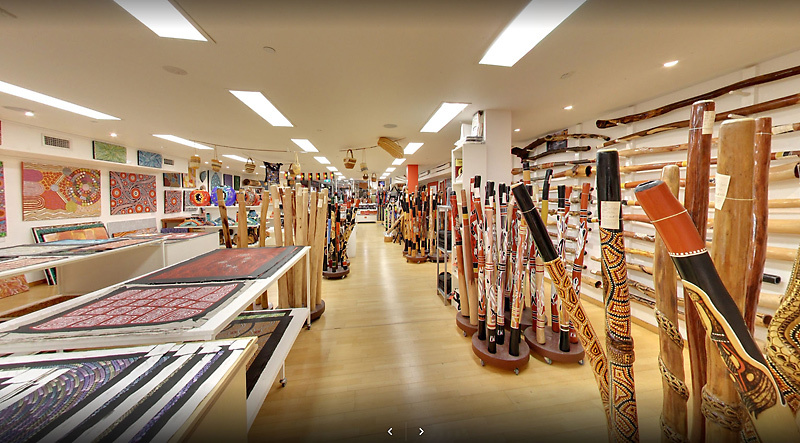 The biggest didgeridoo collection online – by far! A range of prices, styles and keys to suit players of all levels. New didgeridoos from CrookedStixz, Heartland, Tristan O’Meara, Wix Stix, Traditional Arnhem Land instruments and plenty of affordable hand painted and natural finish didgeridoos. Also, some new Iron Bark didgeridoos and the intricate painted and burnt didgeridoos from Eugene Goolagong and Aboriginal husband and wife team Trevor and Olivia Peckham. And if that wasn’t enough, after a long and patient wait we are finally receiving a large bunch of new Kristian Benton didgeridoos in the next 3-4 weeks, as well as a top up from Heartland Didgeridoos, and Wix Stix. So, come and visit Australia’s largest and finest collection of didgeridoos and purchase your authentic eucalyptus termite hollowed didgeridoo either online or in store today! As always, any questions, queries, feedback, requests feel free to drop us an e-mail at info@spiritgallery.com.au or call us on 61 (2) 92475961 and we will do our best to help you. As we approach the Summer period here at Spirit Gallery we thought it’s time for a quick update. We now have almost 220 didgeridoos online. 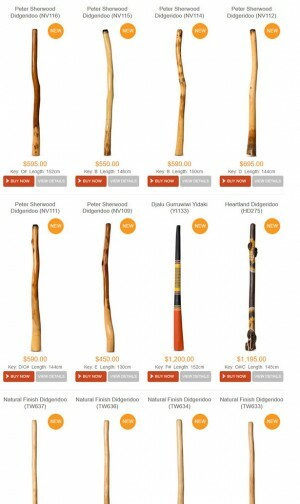 The biggest didgeridoo collection online- by far! A range of prices, styles and keys to suit players of all levels. We have just uploaded some gorgeous new didgeridoos from Tristan O’Meara and Heartland Didgeridoos which look, feel and play like a million dollars!! Also, some new Iron Bark didgeridoos and the intricate painted and burnt didgeridoos from Eugene Goolagong and Aboriginal husband and wife team Trevor and Olivia Peckham. A great new bunch of beginners didgeridoos are also now online, available both in natural finish or a painted finish. In the next 3-4 weeks we are expecting more didgeridoos from Kristian Brenton, Heartland Didgeridoos, Wix Stix and over 20 new Yidaki arriving from Arnhem Land. We now have over 250 paintings available online including new works from Marlene Young, Debra Nangala and new pieces from the Warlukurlangu Community Art Centre. Our exclusive gallery artists Rex Winston Walford and Anthony Walker remain extremely popular and have a variety of styles and sizes always available. Rex and Anthony are also available for custom orders with quick turnaround times of only 2-4 weeks. Spirit Gallery will remain open every day throughout December and January only closing on xmas day. All didgeridoos and artwork are available online or can be viewed in the gallery if you prefer to visit us. And finally as a bonus for all of those that read this blog entry all the way to the end! we are providing a 15% discount on all purchases for the lead up to xmas. That is a massive 25% discount for international customers who already have the 10% sales tax automatically deducted when they enter a non-Australian delivery address. Just use the COUPON CODE xmas15 at the final stage of the checkout process. Offer expires 10th December. Introducing our newest maker Les Peach of Les Peach Didgeridoos! Actually, Les has been in the gallery for almost a year now but being such a meticulous craftsmen his didges have only arrived in one’s and two’s and are often gone before we have a chance to get them online. BUT NOT ANYMORE – Les has now ramped up production and has his own “didge wall” at Spirit Gallery with a promise to keep it full at all times! We have 7 beautiful new Les Peach didgeridoos now available. The work in these instruments is of the highest quality with a sound and finish that has impressed even the most fastidious of our customers. Did we say finish!! The coat on these is about as close as perfect as you can get. The smoothest, shiniest and most impressive finish we have ever seen. You won’t believe your eyes when you get your hands on one of these. So Who Is Les Peach? Les is originally from the UK and began his working career in the Royal Navy where he trained and qualified as an engineering technician. He served 8 years in the navy before leaving and then moved into various engineering positions both in the UK and abroad. It was in 1993 that Les discovered and fell in love with the didgeridoo. He was working under contract in the Falkland Islands at the time and was introduced to the didgeridoo by his brother. This particular didgeridoo was of poor quality but nevertheless, Les felt that there was something very special about this instrument; its sound and energy …and so the journey began. 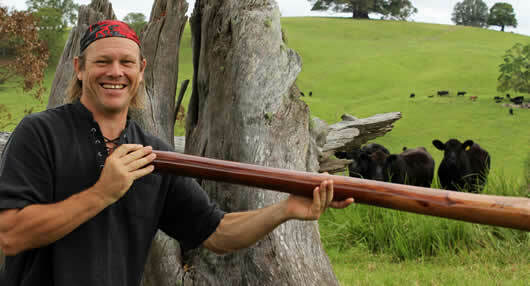 Les bought his first didgeridoo in 1995. He taught himself to play through listening to a music cassette tape that featured renowned indigenous player Alan Dargin. Les continued the journey with his new found passion for this unique instrument. He searched for other didgeridoo music played by skilled artists and, of course, worked on developing his own level of skill and competence. His journey also led him to seek out quality instruments to buy for his own personal use and collection, but this aspect proved to be particularly challenging to say the least. Les always had a love and admiration for Australia as a country in its entirety and one day he made the conscious decision to apply to live there. His dream came true when his visa for permanent residency was granted and he moved to Darwin in the Northern Territory in March 2004. This was a dream come true in many ways including the birth of an opportunity to make his own didgeridoos. Good quality didgeridoos were still not easy to find even in Australia but this was not the only driving force that set Les out to learn what proved to be a whole new trade; the satisfaction of playing an instrument that was sourced from nature and personally crafted by hand was an experience that appealed in conception and later, most definitely proved to deliver in reality. Over the course of the next 13 years, Les Peach Didgeridoos were born, weaned and guided to their mature level of development as they have become today. Why are his didgeridoos so impressive? Les Peach has a background in engineering where a high standard of application and work ethic is necessary to be successful. This coupled with his obsessive nature, perfectionism and attention to detail has brought the standard of his didgeridoos a cut above. All Les Peach didgeridoos are crafted by hand from the authentic native eucalyptus timbers sourced from the Northern Territory. All didgeridoos are of musical instrument grade and are made with keen amateurs and professionals in mind who are looking for that special, clean and pure sound. The timber itself is fully dried and seasoned before it is worked on. This gives the resonance and sound its full quality from the outset and ensures that the wood has fully settled minimising any risk of cracks or splits occurring later on. Les Peach Didgeridoos are fully coated inside and out with a high-end professional product that has an extremely low porosity rating and thus will not be notably affected by moisture and ambient temperature changes. The coating is also exceptionally tough and will “hold” the timber in the toughest of conditions. Every step has been taken and no expense spared in researching and sourcing the ideal product for a coating that would afford maximum protection and minimise detraction from sound quality whilst still giving a pleasing, high-gloss appearance. The finish on a Les Peach didgeridoo is absolutely gorgeous, highlighting the beauty of the timber, and just screaming out quality! Every Didgeridoo carries the Les Peach didgeridoo logo and a unique serial number and are tuned to their natural key. Les Peach’s handcrafted didgeridoos are literally that. 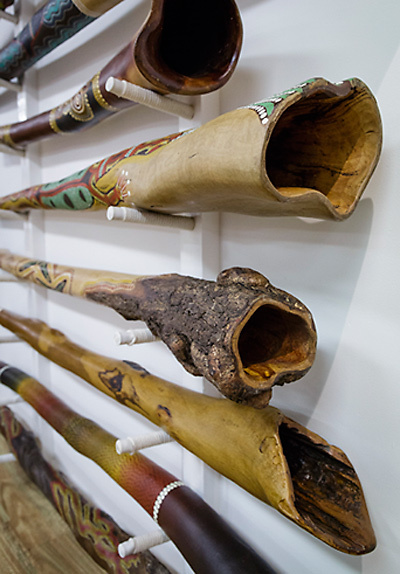 And because they are meticulously tuned, shaped and finished by hand they take time to make and are only produced in small numbers – There is no part of the didgeridoo making process that is automated in any way. Buy a Les Peach Didgeridoo Today! The new breed of hemp didgeridoos have finally arrived at Spirit Gallery with lots of funky shapes, colours, tapers, pressures and keys to choose from. 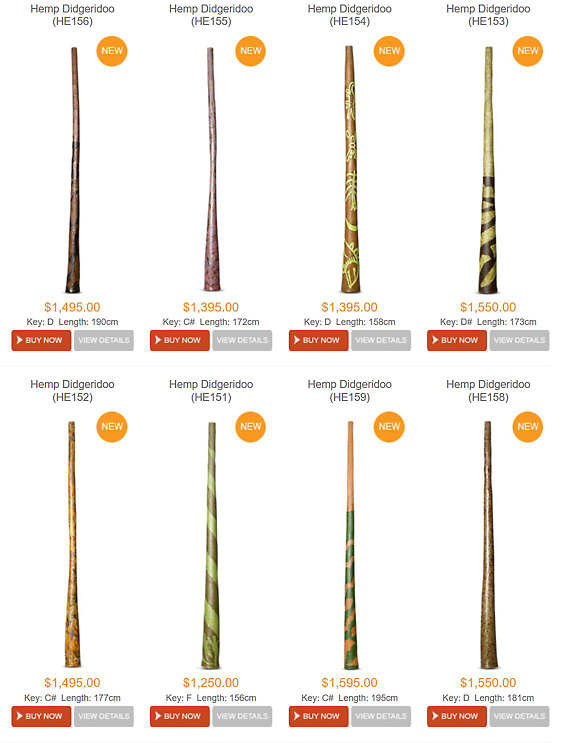 This new batch of hemp didgeridoos are also at a much lower price point than our previous hemp range, without compromising on the quality, making it more accessible to our hemp didgeridoo fans – and we know there are many of you out there!! We have also received a lot of feedback from our customers and in response have focused on didgeridoos in lengths of 1.4-1.9 metres. No big crazy 2.2 metre long monsters that are a nightmare to carry around and travel with! We have also focused on more balanced tapers allowing all the features of the didgeridoo to work in harmony. Our new hemp didges have more gentle medium tapers as opposed to realy big bells that can sometimes be too bassy overriding the clarity of the didge – but don’t worry big bell fans as we will still keep a couple of the big ended instruments for you guys! These didges have been designed to induce both the subtle frequencies and deep resonance of sound and are a wonderful addition to the Spirit Gallery collection of quality instruments. Well who makes our hemp didgeridoos? Let us explain! Our Hemp Didgeridoos are produced by Norbert Schmid, one of the original patent holders and pioneers of the use of the hemp/hempstone for musical instruments. Norbert has been manufacturing didgeridoos (and other instruments) from hemp for over 10 years, perfecting the process to produce in our opinion the most balanced and versatile hemp didgeridoos that we have played. Norbert handcrafts and designs each instrument through a unique process allowing him to shape the inner space of the instruments to extremely fine tolerances. This way he can build a multitude of didgeridoos with different characteristics. Hemp Didgeridoos are made of hemp cellulose bound with water. No additives are necessary. The binding is made by the chemical power of hydrogen eliminating the need for glues resins and synthetic adhesive agents. What is produced is a high quality 100% natural plant fibre material that is non-toxic and extremely durable. The brilliance of this patented Austrian invention is that wet ground hemp fibre is turned into a material almost as hard as stone purely through the addition water. Norbert has developed a worldwide reputation for the design and sound of his instruments, having recently collaborated with the world’s best known didge player, Dubravko Lapaine, to produce his favourite tapers and shapes. Through the use of non-toxic pigments Norbert also incorporates patterns and designs into his didgeridoos using his natural creative flair meaning that not only do these hemp didgeridoos sound good but they also look fantastic. Every instrument is documented, tested and marked with an identifying serial number on the inside of the bell. Why use hemp in a didgeridoo? An ancient cultivated plant, hemp has served mankind for thousands of years. It is one of the world’s strongest natural fibres, valued for its strength and durability with products made from hemp having shown to outlast most other materials by many years. Hemp is used in food, jewellery, clothing, fuels, among many other goods. Leading fashion, footwear and cosmetic houses of today all dabble with hemp products and there is a growing trend to use this wonderful material in many diverse and new applications. One of the most valuable parts of the hemp plant is the fibre, which through a process of wet milling makes its pliable enabling it to be moulded and then hardened into any shape. This allows Norbert to produce didgeridoos with superior resonance, incredible tonal and amazing acoustic qualities. Its been a busy couple of weeks at Spirit Gallery as we set a “didgeridoo upload” record adding over 100 didgeridoos in the last 3 weeks. New didgeridoos from CrookedStixz, Heartland, Natures Vibes, Traditional Arnhem Land instruments and plenty of affordable hand painted and natural finish didgeridoos. We now have over 200 didgeridoos online. But we are not stopping there! Stay tuned over the next few weeks for a new didgeridoo upload bonanza with new sticks from Tristan O’Meara, Bruce Wix, Kristian Benton and much more. We will also be revealing our newest maker- but for now it will have to remain a secret! So, come and visit Australia’s largest online collection of didgeridoos and purchase your authentic eucalyptus termite hollowed didgeridoo today!